This weekend at Esalen has been packed with amazing speakers; their presence so powerful, it feels that they are talking directly to me, as if in a private conversation. 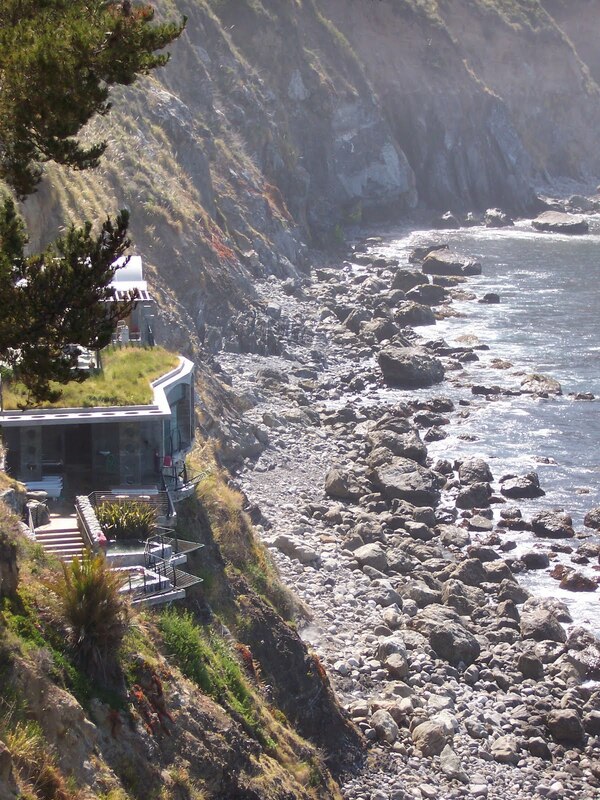 I happen to be at Esalen during its annual fund-raiser. The speakers this year have more to do with social engagement than ever before (at least this is the word on the street….or shall I say cliff edge). And, how appropriate. We need to continue to fortify the relationship between personal and social transformation — they are not separate. And, I will add to that, the importance of environmental transformation. What I mean by this is how and why we shape our environment the way we do — in what way is it a reflection of us and what kind of relationship do we wish to have with our environment? Truly, there is a deep connection between our inner being and thought and how we design our environment. At the panel discussion today on transformation, I took notes and created a list of the 10 ways that transformation takes place in our lives. One of the most poignant questions posed that day was, “do we need crisis for transformation to happen.” The answer was clear that we do not. However, chaos or deconstruction is always present before rebirth and new beginnings. I sense that, if a person or culture does not have a means, tools, or framework to experience the chaos, dark, conflict, and creative potential of transformation ~ that the process will seem fairly frightening ~ and that it will be avoided at all cost and then experienced as a tragedy rather than fuel for the new beginning. 1. Transformation is about choices; when you make a choice that supports your integrity as a human being, the experience of this choice further grooves in the path of transformation — not only for you but for the integrity of all beings. For example, Thich Naht Hahn tried to heal and unify Vietnam when it was in conflict. He also opposed the Vietnam War. Vietnam expelled him from the country. What sprang from this choice was a deepening of his alignment with his integrity. He started an intential community in France called Plum Village and is fiercely engaged with Buddhist philosophy and spiritual activism. He is now an international leader in harmonizing the relationship of spirituality and activism in what he calls “socially engaged” Buddhism. 2. Transformation is being aware of our personal story and its affect on us; the deep ‘who am I’ story comes from around us and how we interact with it; what is this story or narrative and is it supporting the greater good? 3. Transformation is plunging into life; yes, even the painful experiences. Life has its ups and downs; it’s the attachment to these experiences that can cause suffering. Be aware of your personal cycles of life and learn to experience them all as your sacred and noble journey. Many of the difficult experiences are simply rites of passage. Ultimately, we need to bring our whole self to the world — everything needs to be integrated. 4. Transformation is about spiritual serendipity. It is about learning to recognize meaning in life’s events and allowing those moments to be significant. It is this great love that is found in seemingly ‘unimportant’ places where great transformation can happen. Gregory Hodge of Oakland shared a story during the panel about his experience with this. He is African-American and in his early 50s. He was raised in Arkansas (I think just after desegregation of public schools). In college, he saw a poster for a trip to Kenya and that he would earn college credits. He went. His third day in Kenya, a new Kenyan friend took him to his grandmother’s house. His grandmother laid out food and they started talking. The grandmother asked him who he was. Gregory explained that he was African-American, that he was raised in Arkansas, that he was in college and that he was visiting Kenya. Not satisfied with this answer, the grandmother again asked him, “but who are you.” The grandmother soon realized that Gregory was a descendant of the people that disappeared from Kenya some time ago. She told him that she heard stories about people who disappeared from Africa and were never to be seen again. She always wondered what happened to those people and it had always burdened her. She told him that her life was now complete because she had met him. She gave him a hand-woven basket and blanket to take to his mother and said to tell his mom that grandmother sent it. 5. In transformation, risk is necessary. 7. Transformation is investing in what we yearn for instead of investing in what we don’t want to happen. 9. Transformation is acknowledging that there is a part of you that leans toward freedom. Learn tools and gain skills through a dedicated spiritual practice to facilitate openness and receptivity on how to facilitate this movement toward freedom. 10. And, ultimately, life has transformation built into it. Life IS transformation. It’s a given — ripening, ripened, and composting — and right back to ripening. The challenge is accepting all aspects of the experience (even the unripened and composting parts of the experience)… Typically, the modern culture is not very good at the ripening or the composting aspects of the cycle — we tend to cling to the ripened once we have it in our grasp as if it is a permanent state of being. Please feel free to add other stories of transformation to this blog. I look forward to hearing about your journey. >michelle johnston told me about your work. beautiful words. blessings to you.some thoughts and reflections from a post I made years ago at – http://tadhargrave.blogspot.com/2006/01/please-accept-these-things.htmlwarmest,tad* * * "The greatest and most important problems in life are all in a certain sense insoluble. They can never be solved, but only outgrown. "Carl JungHealing is Intergenerational. Healing is not a result you will likely achieve at the end of your life, but a process in which we will all be engaged for many lifetimes. While, admittedly, it's possible that a few of us may achieve enlightenment [although I am deeply, deeply suspicious of those who say they have] the truth is that, for most of us, the healing of our wounds will be an intergenerational process. It can be very freeing to let go of the sense that we will somehow he achieve some image of perfection [that was given to us by a fucked up civilization anyways] by the end of our lives. Many of us are only just, with a deep sense of horrific overwhelm, discovering how very deeply the wounds and sickness of this civilization go in us. We feel staggered and stunned by the incredible amount of work before us. There's so much to learn and, perhaps more importantly, unlearn. Where do we start? It's all so much. These problems we face are not simply things we can "fix" in any mechanistic sense. The goal is not to fix the machine so that it works better, has less impact on the environment and exploits less people — it is, in fact, to question the very notion of "machines". While an abusive parent or spouse is almost certain to never change, a machine is absolutely certainly not going to change — it's not alive.We may not have created the poison but we can become the antidote. We are not victims. We are powerful expressions of Life born of the same force, and the same stuff, as the stars and the Sun. The point is that we are free and yet our civilization would make us all slaves. We are beautiful and yet we are told we are ugly and inadequate. The point is that we’re told we are powerless (and thus victims) when we are not. To play the blame game is not a true act of rebellion. But neither is pretending there’s no problem.To know that healing will be intergenerational takes a great deal of pressure off of our shoulders. It lets us know that we don’t have to bare the weight of the world on our shoulders. That our descendants will take on what we haven’t completed. And that we can seek help from our ancestors. It’s important to know that we don’t have to heal it all right NOW, to know that we won’t do that – to know that this is a long term and deep process of which are a part and to which we can make contributions – but it’s not all about us – to know this changes things. We realize it was unrealistic to ever think we would “change the world by ourselves”. (e.g. myself when I was younger). >Hey there Seb and Tad… Thanks for your kind words… That blog is a reflection piece from a powerful weekend. Tad — your blog is wonderful… I esp like these lines 'We may not have created the poison but we can become the antidote. We are not victims. We are powerful expressions of Life born of the same force, and the same stuff, as the stars and the Sun.' I actually have a meditation that I developed on family lineage posted on my blog as well. This is similar to the sentiments you shared on family lineage healing. Powerful stuff and much of what my journey is about. >A friend forwarded your blog entry "Notes on Transformation" to me. This was incredibly powerful. Thank you! !